The TAP PM Sports Memory Mate series is a traditional style memory mate. These memory mates are designed to hold an individual portrait and a team pictures. 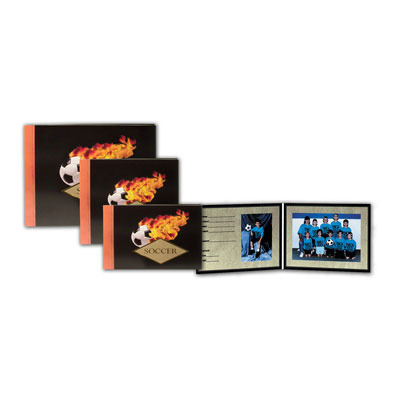 This memory mate series is know for the 'Flaming Ball'. The TAP PM Sports Memory Mate series is available in ten options: All Sports, Plain, Soccer, Hockey, Football, Baseball, Basketball, Softball, Volleyball, and Lacrosse. There is also a coordinating All Sports, Soccer, and Baseball Folder. Don't forget to add foil imprinting with your studio die and the name and date of the sports team. Customers who purchased a TAP PM-1010 Plain Memory Mate also purchased these items. Rate our PM-1010 Plain Memory Mate.